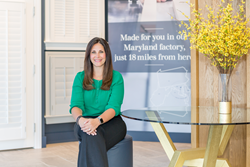 Next Day Blinds President, Allison Siegel Named "Woman to Watch in 2017"
Allison Siegel, President of Next Day Blinds, was named a “Woman to Watch in 2017” by The Baltimore Sun during their second annual Women to Watch event on October 4, 2017. The Baltimore Sun recognized twenty-five Baltimore area leaders as the most intriguing movers and shakers in 2017. It was Allison’s acute focus on growing the company and improving company culture that earned her this recognition from The Baltimore Sun. We started Next Day Blinds in 1993 with one simple idea: to bring people premium-quality, fully custom window coverings in days instead of weeks—at competitive, factory-direct prices. Over the years, our neighbors throughout the Washington–Baltimore area have embraced our “Quality Crafted Locally” approach and made Next Day Blinds their favorite window covering experts. Next Day Blinds continues to offer a combination of advantages unavailable anywhere else. Learn more about the Next Day Blinds difference at NextDayBlinds.com.